Not only was there no-one else from the club there, there was no-one else from the UK. The only other Brit currently lives in Belgium and there were two other Belgians, 3 Dutch, a German, a Finn, a Canadian and an Australian. Quite a group. 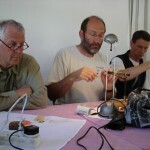 We had Milan Hladik & Karel Krivanec as organisers/guides, Milan also acting as translator for Jiri Klima, the master. 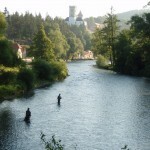 The course was based in the very picturesque village of Rozmberk in South Bohemia, near the Austrian border. This is built around a couple of big bends in the sizable river Vltava which eventually becomes considerably bigger as it flows through Prague. We were to fish it a lot from here to an hours drive away in the national park where it is considerably smaller. The atmosphere was very relaxed, nice hotel right on the river, excellent weather and the beer was ok though it turns out that everywhere seems to be tied to one of the big breweries so it was hard to find the variety of good beers that Czech is known for. That had to wait until I spent a day in Prague on the way home. On the first morning we were encouraged to head out at first light and do our own thing. This was were I discovered that wading in big rivers with large round boulders on the bottom can be a challenge. 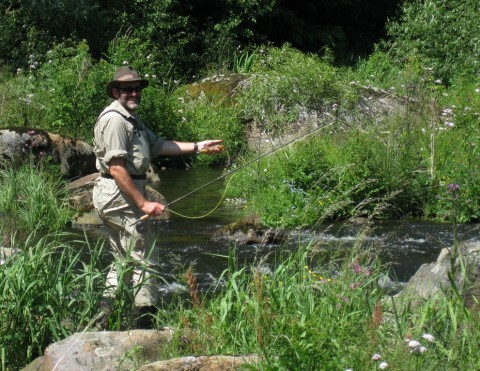 A wading staff is very useful, bad decision not to have one. I caught a couple of trout and a grayling in this hour long session (I got up a bit late). 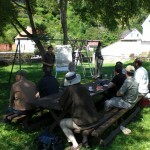 After breakfast we had the classroom session with Jiri explaining leader set up and fly choice, preferred rods and how to read a river. the evening rise. This rise was awesome. 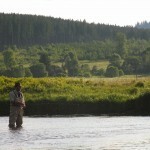 It was a caddis rise that started about 8pm with it being too dark to continue after 9.30pm. Sadly it had already been going for a week so the fish were not really suicidal and many people struggled to catch which was very frustrating when there are fish rising all around you. I like fishing alone but here we had about 50 yds, or less, between anglers. However, due to the volume of fish in the river you really didn’t need to move more than a few yards to keep covering fish for the full 90 minutes. By the end of the session the water surface was literally covered with shucks, not sure how the fish picked out my fly. I struggled for the first 45 minutes until I put on a #16 grey F-Fly (#14 would have been better size) then caught 11 fish. Using just that fly I managed to get into double figures every night. Most of the fish were brown trout of about 1.5lb with a few bigger. Each day then followed the same pattern, up early and fish around the hotel, breakfast, drive somewhere away from the boats to fish, lunch, more fishing, back to hotel for dinner, off to evening rise, back for some tying and well earned Czech lager. On the first two days Jiri was with us and spent time with everyone showing them his nymphing technique – and rescuing me from the middle of the river when I was really struggling to wade anywhere. In my defence there was larger volume of water that day being released from the dam upstream. In spite of my wading problems I was one of the few people not to swim during the week (so perhaps this is a venue for the more agile club members). As shown I fished the two nymphs on a short leader without any sight indicators that I normally use, the end of the flyline working very well as an indicator and within a few sessions was no longer missing takes. 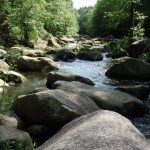 The water we fished ranged from the wide Vltava to the upstream beats which included a very steep boulder garden—real pocket water— open meadows, smaller rocky tree covered sections like a West Country river. We also fished the Malse which was again enclosed and small. On this river I had a great close encounter with an otter which was fishing the same pool as me probably explaining why I only caught one fish in it and that one was in fact on when I spotted the otter. Sadly it didn’t take too long for him to spot me and he quickly disappeared. I really struggled with fishing nymphs in the boulder gardens and resorted to large dries guided round the pools on a short line. Surprisingly good fun and quite productive. All in all a tremendous week and very educational. I only blanked in one short morning session below the dam otherwise averaged 30 fish a day with the worst session being 3 and the best 39 so there is no shortage of fish. They do stock the main river and the rainbows they put in give a really good fight in fast water. I also caught, browns, my first brook trout, grayling, ide, chubb, dace. Even had my first double—two browns on at the same time. Given that all the food & transport was included it was excellent value for money (550 euros plus getting to & from Rozmberk but Easyjet fly to Prague from Bristol). Would I go again, definitely. 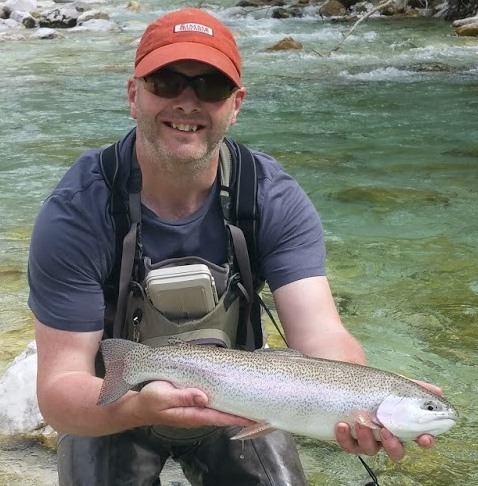 I was considering doing just that next year in fact but have heard that the guy who started this is planning a dry fly masterclass in France, though that will inevitably be more expensive as it is in the Eurozone—no more pints of beer for less than a £1.